Demonic possession – and there are more demons out there and something big is coming. Demonic possession is not uncommon in the genre – but we rarely see it from the lens of Inner Demons. When we see the demonically possessed they are usually victims to be rescued. Or background furniture in some horror as their body is used to do terrible/disgusting things. Or, maybe, they’re just a vehicle for the demon with little actual character of their own. 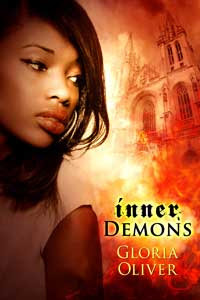 Inner Demon is told from the point of view of Tamara, someone who was possessed. We see the horror and sheer violation of her losing her life. We see the terrible things the demon made her done - terrible because they go against the very essence of who she is and her image of self. The demon destroyed her life and we see this really starkly. Just how she recoiled from little things like her house being redecorated and furniture changed – that simple violation destroyed her home for her. It was almost more powerful than the more gross and obvious violations that so destroyed her self image, her relationships and generally left her life a ruin – because it was more subtle and it was so close to home and worked in the context of that violation. Tamara really conveys that horror and that loss – from the terror she has from simply not understanding what happened to her, to the grief and then, finally, through to the rage that consumes her. It’s true that the angry Black woman is a trope, but in this book it works excellently since it is woven into part of her experiences. It would be unnatural for her not to be angry, not to be utterly furious in the wake of what has happened to her and what she has lost. Her rage is not just a reaction to what happened but a part of her very real depiction of PTSD because she is traumatised, she is wounded. Tamara’s character is also very well informed by being a Black woman – her race is not just a brief biographical note. From her reminiscing of her past experiences to the experiences of her family and even how the demons try to attack her. Her rage at how the demons control people – how they enslave and imprison people is partially routed in her experiences and history as a Black woman in the US. Her outrage over other beings not having choices or free will is, again, rooted in that social consciousness. No matter the circumstances, the idea of any beings being slaves outrages her and feeds her growing rage. Outside of her characterisation we have a decent world with a lot of interesting possibilities. The idea of the demonically possessed, the survivors of demonic abuse and possession, being the ones with the power and the skill to combat the demons and stand against them is something I’m intrigued by since it inherently puts the main victims and trauma victims at the front line of the war. While Tamara is an excellent character, there are no other minorities in this book, nor any other notable female characters. I think the plot and world has more potential than anything else. The story was interesting and Jensen‘s history is curious as someone who has gone before Tamara and has already tried to bury his trauma. As it stands, so far, I don’t think the plot is especially what drives this story so much as the character progression. I think it stands as an excellent introduction to a larger series now the characters have been established.